We work with our clients to fuse the latest research from neuroscience, positive psychology, and systems thinking into practical daily actions that help people, leaders, teams and organizations thrive more consistently. Improve the resilience, wellbeing, and performance of their leaders and their people. Develop the strengths – the things their people are good at and enjoy doing – to improve engagement, productivity, and customer satisfaction. Design and deliver appreciative inquiry change approach in schools, communities and across workplaces to create positive changes. Grow the confidence and potential of female leaders in dynamic and demanding environments. Of course each of our clients need slightly different solutions. 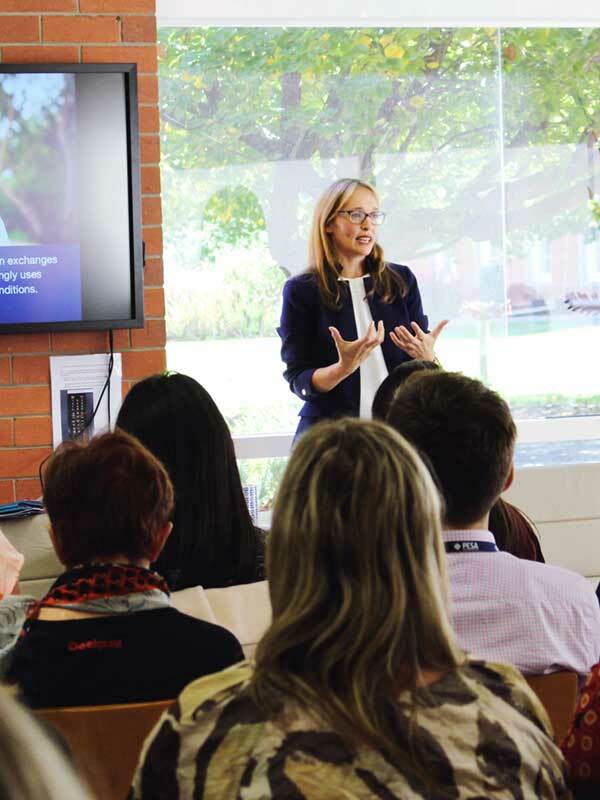 The University of Melbourne to work alongside other training providers to research, develop and deliver the first manager's training program. In particular, we were sought for our strength in developing people's resilience and wellbeing. Independently gathered results found that more than 91% of participants were confident they could apply the knowledge and skills they learned and 98% said they would recommend the program to their peers. ANZ Bank to develop the strengths, growth mindsets and relationships of senior leaders across their branches as part of a wider leadership development program. After four years, our workshops continue to be consistently rated one of the best sessions in the program by participants. Using affordable, evidence-based measurement tools we help you gain real insights into how your workers, teams, and organizations are doing, so you can ensure your investments build on what’s working and address the areas where people are struggling. Our acclaimed PERMAH Workplace Survey measure – created with Dr. Peggy Kern from Melbourne University – quickly, affordably and reliably measures the wellbeing of your people, teams, and organization. FirstBest Heart Rate Monitors to measure people’s physical wellbeing. VIA Strengths Survey, Strengths Profile or Gallup StrengthsFinder to measure people’s strengths. Psychometric tools including DISC and MSCEIT among others. Building a common language and shared evidence-based toolbox enables conversations about finding ways to thrive and to more confidently navigate struggle, can cascade throughout your workplace at all levels. Face-to-face workshops – in the room with your people or by video conference or telephone. Popular podcast series that can be listened to anywhere, at any time, and repeatedly complete with individual and team challenges and cheat sheets. Digital playbooks and toolboxes packed with practical activities. Creating safe group coaching check-in spaces to ensure new behaviors are not just taught, but caught and successfully integrated and amplified into the everyday realities of people’s busy lives. Coaching one-on-one for leaders or groups. Coach-the-coach training for leaders and champions to hold safe and effective coaching check-ins for their teams or peers. Tailored coach-the-coach training guides with step-by-step instructions and recommended questions. Sustaining the changes your people have created by helping them discover what’s working well, dream of ways to built upon their strengths, design the next steps forward, and deploy the actions they are committed to following through on, so these new ways of working truly lift your organizational culture. Teaching and coaching leaders and champions to design appreciative, human-centered design experiences to create lasting change. Facilitating face-to-face or virtual appreciative, human-centered design experiences for 20 – 200+ people. Treasury Wine Estate improve the confidence and resilience of almost 1,000 female leaders across a nine-month program in Australia, China, Singapore, the UK, and the USA. Independently gathered results showed 91% of participants would recommend this program to others, and 98% rated the facilitators highly. Xero design and deliver an ongoing, multi-level, global leadership program alongside existing training providers to embed positive psychology practices and support leaders learning how to lead themselves, lead others and lead the way to realize Xero’s business goals. Independently gathered results showed that 92% of participants rated the resources provided in these programs highly. We work closely with our clients and any existing training partners they may have, to ensure we build on your existing investments and realize your hopes for the future. Every time we work with you we provide a wealth of resources to support your investment including surveys, presentation slides, digital playbooks, cheat sheets, and follow-up resources. These are yours to keep and use internally as you wish – with or without us in the future. Why? Because we are 100% committed to creating effective, affordable, and flexible solutions to help people thrive more at work. We also make sure anything we create for you can easily be scaled across your organization, and that learning leaves the classroom and is intelligently embedded into people’s daily mindsets and behaviors – no matter how busy things might be. Wondering if we can help you to create the kind of transformational support your organization needs?